Wangjing, a sprawling residential district in northeast Beijing, is known locally as Little Korea. The nickname makes sense: it's where 100,000 Koreans live, work and play. Naturally, they all need to eat, and while excellent barbecue and bibimbap joints abound, it's the North Korean eateries that are really worth a visit. If you have yet to set foot in the D.P.R.K., Wangjing will give you your very own taste, minus the visa hassle. The main draw, however, is a nightly cabaret show staged by the uniformed waitstaff, who take to the mic while executing perfectly timed formation dance moves; meantime, their colleagues provide musical accompaniment on Yamaha keyboard, semi-acoustic guitar and fiddle. The result finds its closest sonic equivalent in the bleeping score of the 1980s video game Tetris, while a flashing LED screen provides a mesmerizing bonus feature in the background. If you're lucky, all this will be capped off with a magic trick, which may or may not involve two drinking glasses being lifted with a chopstick. 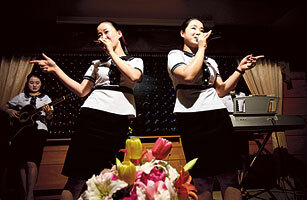 O.K., so it might not be an accurate reflection of the real Pyongyang  but it's probably a lot more fun. For more travel tips and stories visit time.com/travel.